This is the first personal request in the Lord’s Prayer. Until now we have been focused on honouring God’s Name, seeing His Kingdom grow and His will being done on earth. And that is only right. Prayer - expect perhaps emergency prayer [i.e. I need help this minute or someone is dying] - begins by focusing on God, honouring His Name and Kingdom and seeing things in correct prospective. It quiets our spirits so we have a right attitude as we enter the courts of the Most High King - Who is also our Father. But our Father cares about our every need and desire so in the right time we bring our requests before Him. Although this request looks at our needs, it is not really a change of subject from the preceding part of the prayer. In the beginning we wanted God’s Name honoured, His kingdom to come and His will to be done. In other words, we want His presence and power on earth to the glory of His Name. In order for us to fulfill our role in making this happen we need our daily bread. If we are having to spend our time in survival mode we do not have the time to work, through the power of the Holy Spirit, at seeing His kingdom and will established on the earth. So this part of the prayer flows naturally from the previous and is not self-focused. We are asking for what we need to accomplish what God has given us to do. What is this bread that we are asking for? There are two aspects. 1. Then Jesus declared, "I am the bread of life". John 6:35, NIV. Jesus is the Bread of Life. We need to feed on Him and on His Word daily to grow strong and move into the purposes of God for our lives. While it is an act of our will to spend time in the presence of Jesus and to study His Word, it is also true that we only learn spiritual things as the Holy Spirit reveals them to us. In asking the Father to give us our daily Bread, we are asking that He will reveal to us the things we need to know for that day. You can probably think of a verse you have read many times. You understand the meaning, but it is just there. Then one day, you read the verse and suddenly it was real to you, you understand it as never before. You have been fed with the Bread of Life! Spiritual things are learned and absorbed by revelation not by the senses. 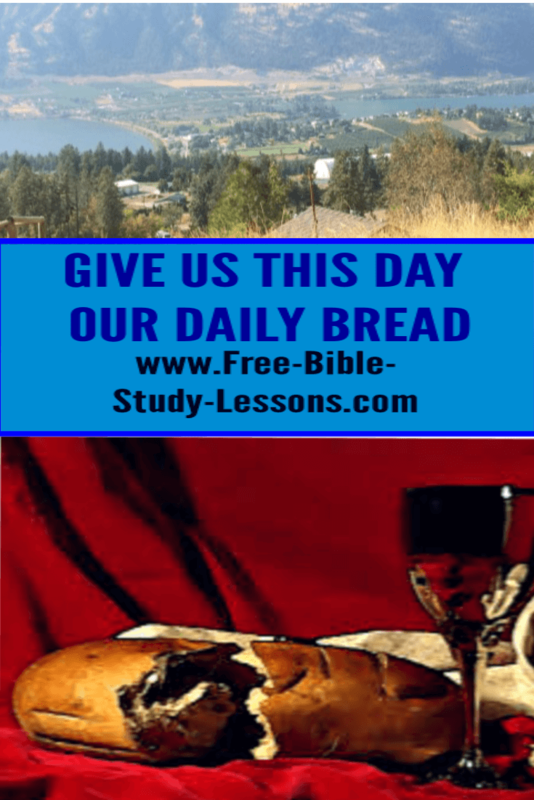 In asking the Father to give us our daily Bread we are recognizing our dependence on Him. Without His merciful and gracious acts toward us we would remain forever in the dark, spiritually starving. It is His delight to feed us, but we must come to Him. We must show that we are serious and have hunger and desire for the true Bread. Too many people, like the 5,000 Jews whom Jesus fed [John 6:26-42], only want to manipulate spiritual treasures for personal gain. The Father is not fooled. The Bread of Life belongs to the Children of Life. 2. In asking for the Father to give us our daily bread, we are also asking for His provision for our physical needs. We are human beings. We have certain needs that must be met for our survival - food, clothes, shelter, relationships, etc. Since our Father knows we need these things [Matt. 6:25-34] and it is His pleasure to give them to us as we seek first His kingdom, why do we need to ask? Asking for our daily bread shows we recognize our total dependence on the Father. We can see this when we are in desperate need with no hope, but when we have a good job and our needs seem to be automatically met it is easy to forget that we are dependant on the Father. While He may - and usually does - use natural means of supply, it is still from His loving hand. Asking, when we are in the midst of plenty, reminds us of reality and helps us keep our focus on the Kingdom of God. It shows that our faith is truly on God and not on our circumstances. The other aspect we need to look at is that this is daily bread. While it is certainly wise to plan for the future as much as we can, we do not worry about the future but live in the moment. We focus on what we are doing and can do at this moment in time. We all know how frustrating it can be to talk to someone whose mind is somewhere else. We need to learn to live in the moment - to be fully present for the Father and those around us.